Prev April’s Parenting Book Club Pick: Minimalist Parenting Next How To Create a First Year Baby Album. Fast. My daughter is 4.5 months old and she has just begun some of the telltale signs of teething, such as gnawing on her hands, her blankie, toys, myself and anything else within arms reach of her mouth. 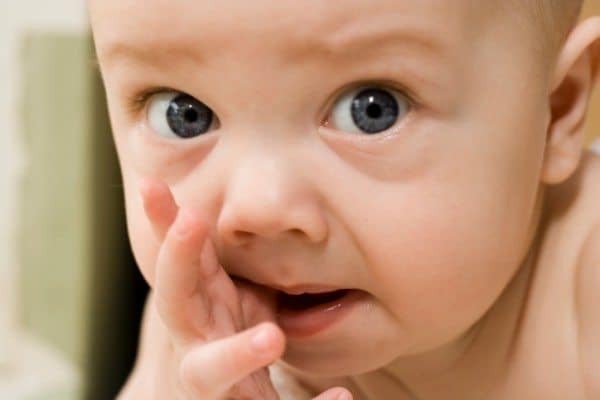 Typically, teething begins anywhere between 3-12 months… which basically says there is nothing typical about teething. Babies can display many symptoms such as extra irritability due to soreness of the gums as the tooth is trying to poke through. They may try to bite fingers or toys in an effort to relieve pressure from their gums. Some parents report rashes around the mouth which is most likely due to the massive amounts of drool being constantly wiped from their chins. Teething symptoms usually last from about a week before the tooth makes an appearance and disappear as soon as the tooth pokes through the gums. Well, until the next tooth tried to enter the scene and the whole symptom cycle starts again. Kids continue to get their baby teeth in up to the age of three, which means, you’re going to be dealing with this teething thing for quite some time. (below is a handy baby Tooth Tracker). I don’t remember my first daughter being excessively fussy when she started teething but I do remember insane amounts of drool. Like Niagara Falls levels of drool. 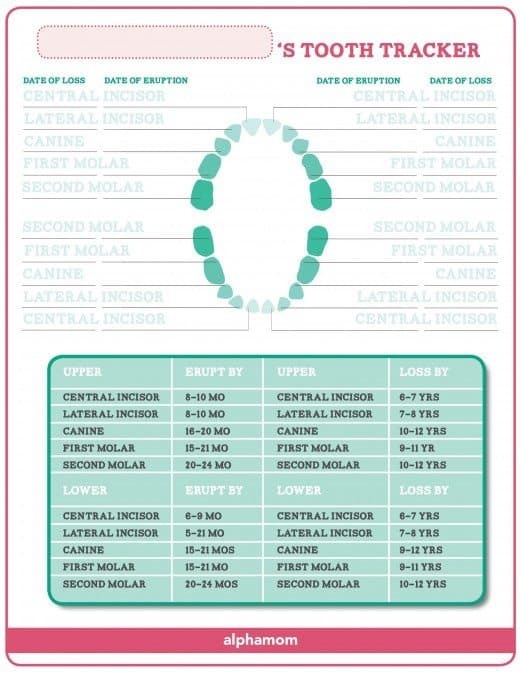 To make teething more fun (yeah…haha), I designed this printable Tooth Tracker so that you can record the dates of your child’s baby teeth eruptions and losses, along with a handy time table of approximately when you should expect them. Print the tooth tracker, fill out the dates and put it in a keepsake box. Eventually, you can use it to rehash war stories to your child about what you went through when he was teething. He’s gonna want to know the truth when he has kids of his own! Baltic amber teething necklace all the way! Those charts are all backwards for us. Our little man consistently gets them back to front. We usually work out after the event too that, oh yeah, grumpy, bad sleep, dodgy nappy – all explained by those teeth we’ve just spotted. Expecting another set of molars soon. Yay! That’s so interesting. Of course, this chart is what the ADA says is the “typical” tooth eruption and loss schedule. As we all learn, there a wide range in typical and even when things don’t work on the “typical” schedule, everything usually turns out alright. That tooth chart is impressive!!! Wow. Thanks for including me in this piece. Excellent work as always from the fantastic Ilana Wiles! This is really a very good, straight-forward post about teething. That tooth tracker chart is awesome! As with all things human, those ages are just averages. Nothing to get worked up about if your child doesn’t seem to have gotten the memo about what he is “supposed” to do. 🙂 It’s interesting to record the tooth information because teething patterns are more of a familial thing. Your little darling is more likely to follow your teething pattern than the chart’s. had no idea that tooth eruption patterns (also, i can’t believe i just wrote that) follow familial patterns. Thanks!